Hi guys. How's it going today? I'm doing something a bit different than my normal reviews so I'm pretty excited. 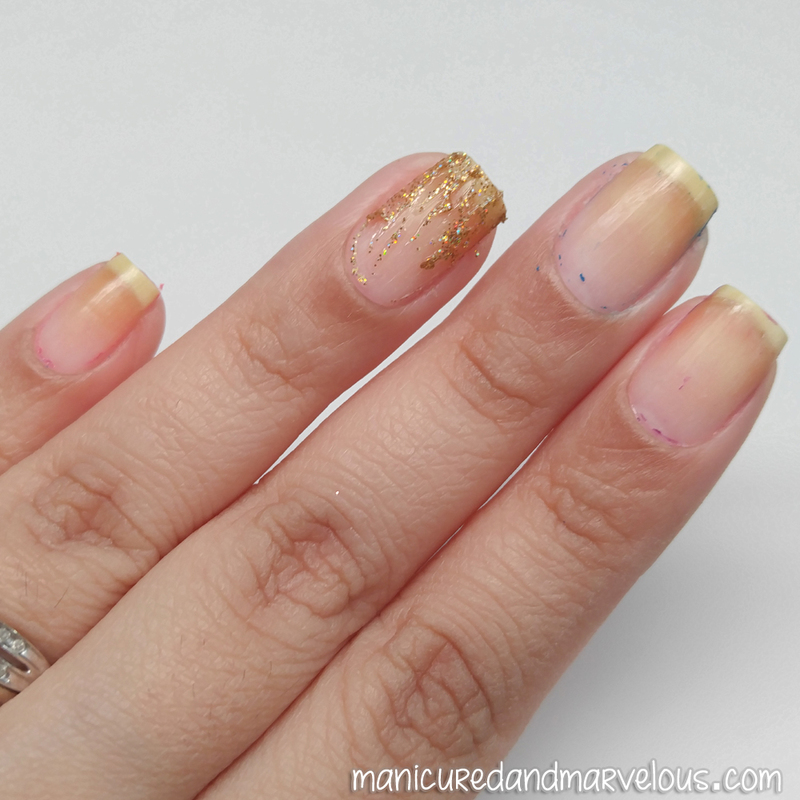 Typically I don't tend to do reviews on nail care products too often. Though to be honest I am starting to think I really should. Especially when it comes to things I really end up loving and using regularly. 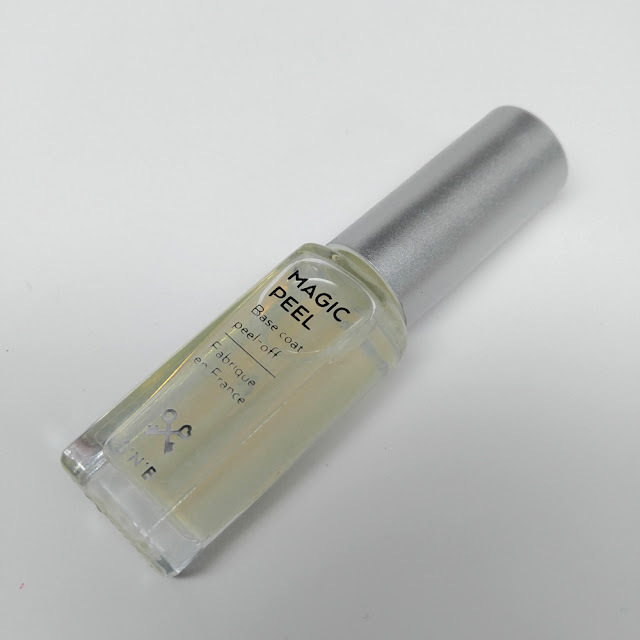 For the past few weeks I have been using this product and I am finally ready to share my review for the Safe 'N' Beautiful Magic Peel-Off Base. I will also have a video showing it in action down below. S'N'B' Nails have a large selection of products including children friendly nail polish and a line of nail treatments. All products on their website are available in more than 58 countries all over the world. The Magic Peel-Off Basecoat retails for 7.50€ (euros), which ends up being a little over $8 USD. Let's get some of the obvious out of the way first. Yes, my natural nails are stained unfortunately but they are healthy. As someone who paints her nails at least a dozen times a day, every day, this is normal. S'N'B Magic Peel-Off Basecoat is not the first of its kind and I have had experience with quite a few notable ones in the past. The two most notable and ones I have the most experience with are Yellow Stopper from Sally's Beauty Supply and OPI's Peel-off basecoat. Hypo-allergenic— Our products are chemical, Paraben and toxin free, so nails are kept safe and sound and splendidly colored. Offers nail protection — Nails are efficiently protected against staining and yellowing due to pigments discoloration. I have a video review of the S'N'B Magic Peel-Off Basecoat and you can see the peeling in action. I used one single thin layer of S'N'B Magic Peel-Off Basecoat per nail. In the aftermath I do feel I should of used a thicker layer for each nail. I applied two - three coats of polish and a fast drying topcoat per nail. I then waited approximately 45 minutes for each nail to dry. I did not use acetone for any removal during the video. As I mentioned in the video, here's my list of some quick pros I found while using this product. The base coat dries super quickly on your nails, around two-three minutes. I felt it was not any longer than a normal base coat would be. The S'N'B Magic Peel-Off Basecoat has a clear base unlike some other similar products. Aside from swatching, a regular manicure lasted three days with minimal peeling around the free-edge. On the third day I had a large piece peel itself right off. There is no extra smell to the base as I expected there to be. In fact it has a very minimal smell to it at all. It makes glitter removal a breeze. Even with the minimal residue it is a much faster way of removing polish. It does not fully peel off all your polish. No matter how many times I tested it I never got the polish 100% off my nail. As a swatcher/blogger I can't really get use of this on a daily basis. Usually as far as swatching goes, the polish would not be fully dry for removal and would probably be more of a mess than helpful. Applying thick coats or two coats can sometimes make the nail too clumped and will cause visible bumps in the polish finish. Overall my experience with S'N'B Magic Peel-Off Basecoat was definitely much more pleasant than I was expecting it to be. I think my fellow polish addicts will find this super useful even moreso than I did. Especially those of you who may have given on up glitters solely based on how much of a pain removal can be. Without a doubt, it blows away glue-based peel off basecoats with the dry time alone. So while I won't be using this on a daily basis due to my swatching needs, I will definitely be using this for my weekend manicures (especially when I use glitters). 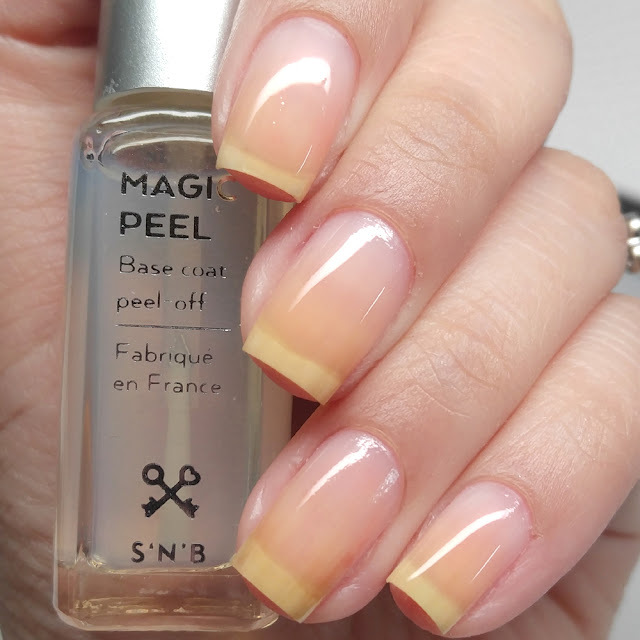 Tell me guys, what do you think of the S'N'B Magic Peel-Off Basecoat? Have you tried it before or do you have a similar product you prefer? What is that gold polish you used in the video? That's gorgeous! Thanks for the video review of these peel off base. I don't mine using a swipe of acetone after a peel off, as long as it's just to clean up small pieces and I don't need to soak glitter off. This sounds like a great product for when I want to wear something for a few days and take it off quickly. As someone else mentioned this is sort of how yellow stopper worked for me. I rarely wear polish more than a day but I like these kinds of polish with a glitter. I love a good peely base! I'm glad you did a video. I haven't ever been a fan of peel off base coats though. Not one I'll be trying.